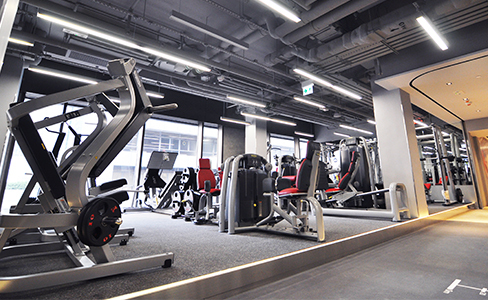 Fitness First boasts a large state-of-the-art Gymnasium with Grade ‘A’ Technogym cardio equipment that come with audio and visual entertainment and more than 20 pieces of weight machines. It also has a fully equipped studio for Group Exercise Classes, Muay Thai and Yoga, including Hot Yoga and Aerial Yoga, a Cycling studio for group cycling classes, Large area for Freestyle™ Training, offering wide range of modern fitness equipment, including Monkey Bar, TRX Suspension Trainer®, ViPR, Rip™ Trainer, Battling Rope, Octane elliptical and more. Customers can relax at a private lounge with complimentary beverages, reading materials and computer terminals with complimentary internet access.